I have been reflecting on my experience in designing, buying and selling fashion jewelry and accessories and ways to improve the overall customer experience through listening to the most frequently asked questions. Customer feedback is gold…pun intended! Even something as simple as shopping for fashion jewelry has customers at different stages of their buyer’s journey. This is the classic path of identifying a need/want, collecting information, evaluating options, purchasing and follow-on using, reviewing and hopeful referring and repeat. Customers don’t always explicitly tell you where they are (I am just browsing, I need a gift), but you can hear it in questions that they are trying to make a decision with these in mind. One of the most common areas of uncertainty is around GOLD and the difference between solid, filled and plated. I design jewelry and care about quality and skin sensitivity in my earring findings (hooks & posts) so I started where anyone would and Googled to get educated. Many sources go into the nuances of processing and technical details like % of weight, but for an average user this is not an easy enough elevator pitch to follow. So I made a simple diagram to summarize it in one picture. Of course if you would like all the technical details you can find tons online or hit up your local artisan metalwork shop. 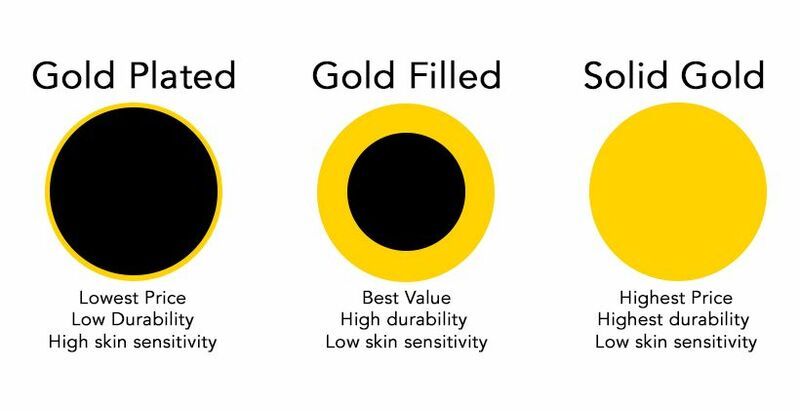 There are basically 3 categories of questions that customers inquire about the most when it comes to gold fashion jewelry: Skin sensitivity, durability / tarnish and price / value. We live in the age of increasing allergies and many women have known sensitivities to various metals that cause skin reactions and discomfort. Some people know specifically they can’t wear base metals, nickel, copper, brass and can only wear a quality gold or sterling silver / surgical steel for example. If you don’t know or have a daughter getting her ears pierced for the first time you can always have allergy tests done at a doctor / dermatologist or just test a few earrings and watch closely for irritations. Gold Plated is a thin layer of gold often electroplated to a base metal like copper or brass. Gold can rub off due to normal wear exposing the raw metal beneath and may tarnish and color or irritate skin if sensitive. Many of us have had the turn your skin green experience, which can be a culprit reaction of skin acid and copper (and some silver and gold). So as the old adage goes, you get what you pay for and each person is unique in their own tolerance and reactions. Gold Filled is a thick layer, which is heat or pressure bonded to a core metal (often sterling silver, copper or brass). Because its thick wall, the gold should not flake or rub off and should not expose the base core metal. This allows it to be skin safe. However, for people with ultra sensitivities it is good to ask for things like nickel free verified or ensure sterling silver is the core etc. so you have double insurance. Solid Gold is actually soft so it is typically alloyed with another metals to hold up for daily wear. Grade ranges from 14-24 karat with highest concentration of gold. This has similar safety to gold filled but the price is much higher as you are paying for the weight of more gold as there is no core metal filler. If buying a gift, we recommend asking ahead or looking at what the person you are buying for wears most often. Sometimes you can only tell the color silver or gold, but you would not know what grade. Of course if you want to surprise we have a return policy if there is any sensitivity and need to exchange. Gold plated is the least durable and may tarnish (discolor) or chip in heavy daily wear. Filled and solid gold both are tarnish free and have high durability for daily wear over a longer time. As with any fashion jewelry, care and maintenance ensures a longer life, so proper cleaning, drying when wet, and environments they are worn in make a difference to add or subtract to wearability over time. There is a direct correlation to durability and price / value of gold. Plated tends be the cheapest, but also shortest lifetime and highest skin sensitivity potential. Gold filled tends to be a mid-range reasonable price point for comparable skin security and lifetime value of use to solid. However, solid gold is a great investment piece if willing to splurge a bit more. 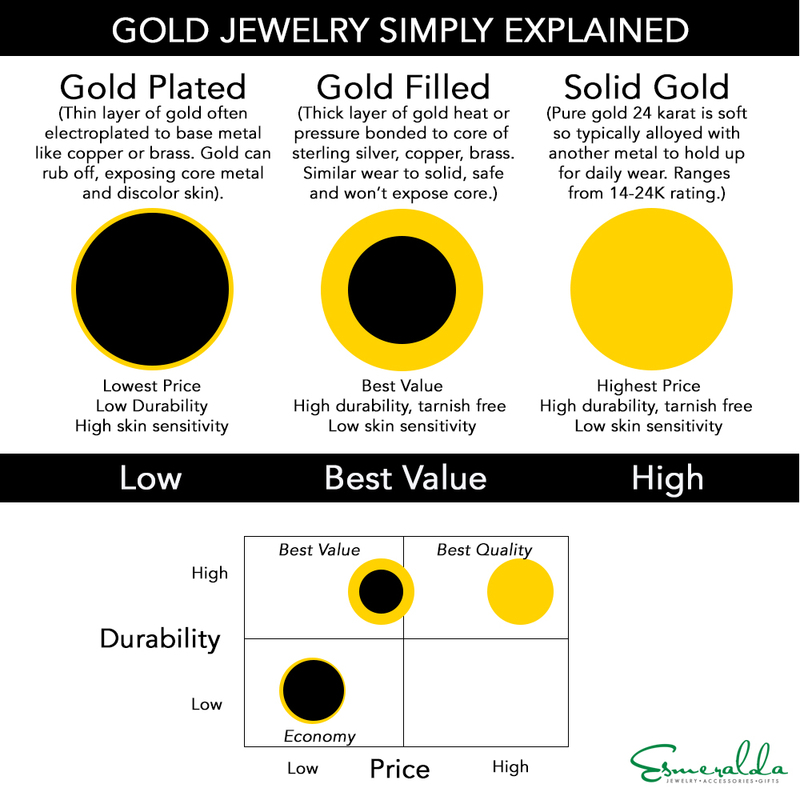 Best quality for the value is an important to the criteria to be in my Esmeralda store, so I prefer to carry gold filled jewelry as it hits a nice sweet spot of quality durability and price between solid gold and gold plated. But this is very personalized decision and better safe than sorry, so if super sensitive then I direct customers to sterling silver which tends to be a great alternative. Oh and if you ever forget the difference just think of a candy coated chocolate…it is a similar concept and easy to remember. Well I hope this simple diagram helps and do please comment or message if you have any questions on specific products / handcraft artisans I carry! To see more of our socially conscious, handmade, gold filled jewelry SHOP online @ www.EsmeraldaStore.com or Esmeralda store @ 54 Church, Street, Harvard Square, Cambridge, MA. Esmeralda came to the US in 2010 and graduated at the Babson MBA program where she met her now husband Matt. They cofounded the ESMERALDA LAMBERT business and have grown Esmeralda’s original signature handwoven statement jewelry style to be carried in over 40 stores in 4 states while expanding to a team of 7 artisan women. They recently opened their 1st retail flagship store, ESMERALDA, in the heart of Harvard Square, Cambridge, MA where she supports not only her line, but also a hand picked selection of 15+ independent family business designers from the US and 9 countries who meet the criteria of handmade with social responsibility. As the company grows they continue to shed light on unique ethically handmade fashion while supporting more artisans and family businesses in the Dominican, the USA and around the world.